P2P mortgage lending giant LendInvest has crossed the £300m mark in cumulative lending volume. The landmark coincides with the platform’s second anniversary. LendInvest launched in May 2013 as a spin-off of the bridging loan fund Montello Capital, and is now the world’s largest marketplace for peer-to-peer funded mortgages. The platform has essentially succeeded Montello as the primary business operation, having merged with its creator back in October 2014. Montello had always been responsible for originating and servicing loans on behalf of the LendInvest platform. The merger simply meant that the entirety of Montello's origination and servicing powers were transferred to LendInvest, with the former continuing to exist only as a fund manager. LendInvest’s ties to Montello have been an important facet of the platform’s growth. The two entities officially blended their lending data in August, two months prior to merging operations fully. Montello had been purchasing whole loans from the platform since July 2014 – a move seemingly contrived to signal to third party institutional lenders that LendInvest was open for business. 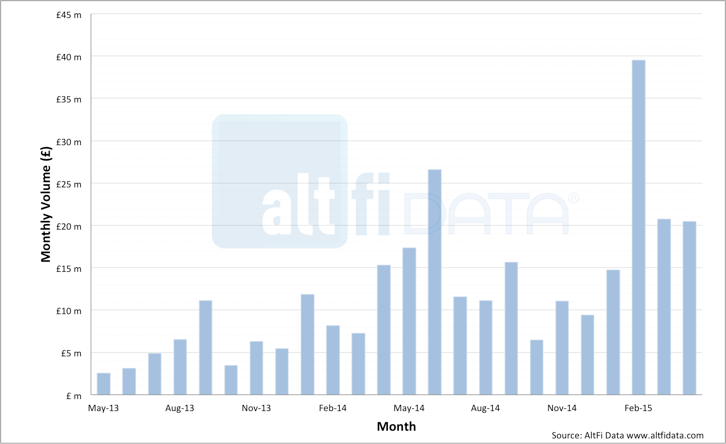 A chart showing LendInvest's monthly loan volumes to date. Recall also that LendInvest dropped IPO hints in early February. The platform reportedly intends to float on the London Stock Exchange at some point in 2015. Given that cumulative lending volume is, rightly or wrongly, often leant upon as a core metric in valuing an alternative lender, the timing of LendInvest’s surge in volumes couldn’t be better. But does LendInvest’s accelerated growth signal a dangerous descent along the credit curve? You’d like to think not, given the recent hire of ex-Credit Suisse man Paul Jeffery as CFO and Head of Strategy. Mr. Jeffery, who is tasked with taking LendInvest to market, called the prioritization of asset growth over asset quality “a tragic mistake”.